This is a portable umbrella that measures 26” across its canopy. The size of the product makes it a handy sized umbrella. It is designed using high-quality material and has got a lightweight. The umbrella is an excellent travel companion. It automatically opens and closes by pressing the button located on the handle. It also features gunmetal coloured aluminium shaft, giving the umbrella a classy look. It also has got fibreglass ribs, windproof frame and colour co-ordinated handle trim. This Galon umbrella has the option to laser engrave your company image on its handle. 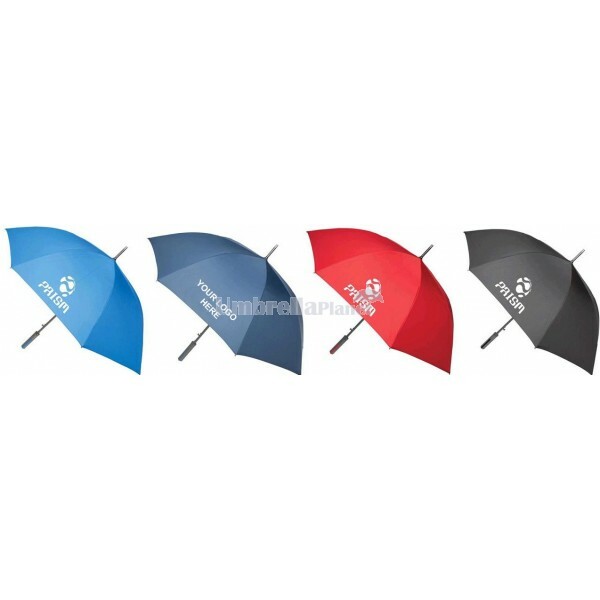 This feature comes as a blessing as it ensures that the umbrella can be used for brand promotional purposes. The imprint methods include on panels screen print, as well as on handle laser engrave. This umbrella can be used during rainy seasons, as well as sunny days. It can be taken anywhere and the material quality used does not hold water; thus making it comfortable to use it when using public transport. You can get this logo branded umbrella by placing your order online. Standard delivery timeframe takes up to 2 weeks. Fast delivery is available upon request at an extra cost. Pricing includes one colour, one position printing. There is a $60 set-up fee that is charged. Note that all prices exclude GST. Also available upon request is price match. Umbrella Planet is dedicated to giving you fast and secure delivery within Australia. We service all states and territories including; VIC, NSW, ACT, QLD, SA, TAS, NT, and WA. Contact our sales team for exact delivery costs and times to your location.